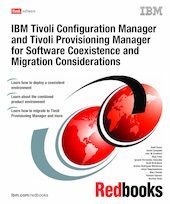 This IBM® Redbooks® publication focuses on migration of a data center from a Tivoli® Framework environment and a Tivoli Configuration Manager-based management model to the new Service-Oriented Architecture (SOA), provided by Tivoli Provisioning Manager for Software V 5.1. In addition to migration, we also discuss the coexistence environment, where Tivoli Provisioning Manager for Software drives the Tivoli Management Framework environment. Because Tivoli Provisioning Manager for Software shares its roots with Tivoli Provisioning Manager 5.1, all of the migration scenarios we describe in this book apply to Tivoli Provisioning Manager 5.1, as well. To give you ideas for various migration possibilities, we describe several customer environments and then describe the suggested approach for moving to a Tivoli Provisioning Manager environment. We also tell you how the two environments can coexist during the migration process. We provide a feature-by-feature comparison between common Frameworks, Tivoli Configuration Manager operations, and their equivalent in Tivoli Provisioning Manager. This book is a reference for IT Specialists who implement data center migration from a Tivoli Management Framework and Tivoli Configuration Manager-based management model to Tivoli Provisioning Manager for Software V 5.1 or Tivoli Provisioning Manager V 5.1.